But as Gleckman’s Tax Policy Center colleague Jim Nunns models out in a new report, it is still possible to construct a tax plan that includes a 15 percent corporate rate but doesn’t carry the same downsides in terms of federal revenue, distributional effects or economic impact. Nunns’ neutral tax plan does involve trade-offs, of course, like the creation of a 7.5 percent business-level consumption tax. 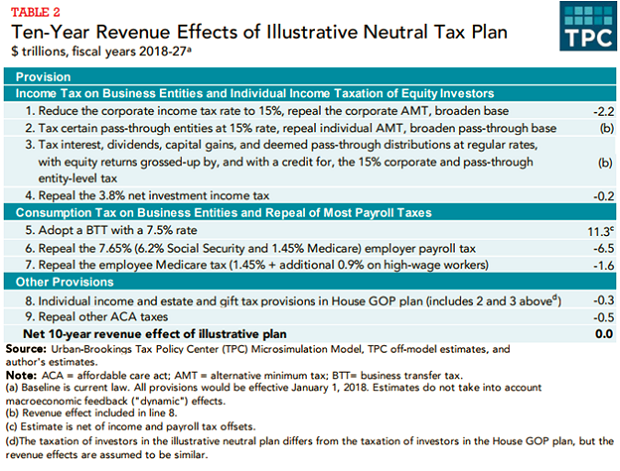 You can read Nunns’ full report here or scan the table below to get a broad overview of how it gets to revenue neutrality.